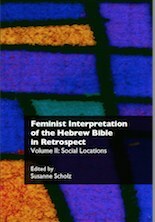 This is the second of a set of three volumes reviewing the progress of feminist Hebrew Bible scholarship over the last 40 years. In it, fourteen essayists focus on the feminist work from various geographical areas and different hermeneutical locations. 5. THIRSTY ENOUGH FOR FEMINIST BIBLICAL INTERPRETATION?